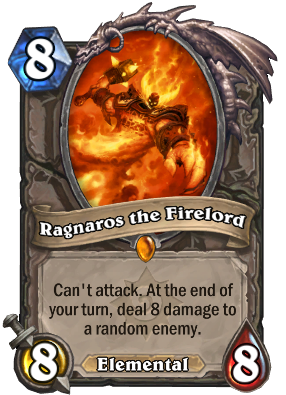 Ragnaros the Firelord was an incredibly powerful Elemental Lord and master of all fire elementals. He ruled for more than three hundred years over his minions from deep inside the fiery core of Blackrock Mountain. After being banished back to the Firelands, he aligned himself with Deathwing and his fellow Elemental Lord, Al'Akir, in the effort to purge all life from Azeroth. To help bring about the end of days, Ragnaros laid siege to the World Tree Nordrassil on Mount Hyjal, unleashing his most powerful minions. Despite the incredible destructive forces at his disposal, the mortal champions of Azeroth were able to lay siege to the Firelord's domain, where they bested all of the challenges he laid before them, and eventually destroyed him within his own fortress.